In the northwest territory of the metropolitan district of Quito (MDQ), there is a diversity of private, governmental and non-governmental organizations, associations and communities committed to making the Northwestern territory of Quito a sustainable landscape. However, threats to this landscape require greater efforts to strengthen environmental governance, articulating efforts at different levels. The Chocó Andino Model Forest is a platform that allows creating and strengthening an environmental discussion, which promotes programs and projects with sustainable production and conservation purposes. In the surrounding communities where this project is located, it stimulates the vision of a new model of development and relationships with the land. With this in mind, the Chocó Andino Model Forest’s main challenge is to consolidate itself as the platform that allows respectful debate, consultation and the structuring of agreements with all the stakeholders in the territory. The establishment of an alternative development model that takes into account the particularities of the region, based on the diversity of existing ecosystems, the diversity and sustainability of production systems, the strength of local capacities and the restoration of ecosystems, is essential. The northwestern territory of the metropolitan district of Quito (MDQ) is a mosaic of natural landscapes (52%) and productive sectors (28%). The rest of the territory covers areas of natural regeneration, urban areas, and infrastructures. The natural and cultural wealth of the 124,296 ha is important, as it is located in two specific areas of biodiversity, the Tumbes – Chocó – Darién site and the Tropical Andes region. A high biodiversity and, above all, a high level of endemism characterize this combination of eco-regions. This is why the territory is considered a priority for conservation at a global level. At the national level, according to the priority study for the conservation of biodiversity in continental Ecuador (Cuesta et al., 2007), this area consists of a conservation gap in the national system of protected areas. In the region of ​​the Chocó Andino Model Forest, there are 11 ecological systems that range from high mountain meadows (páramos) to rainforests in the high mountains and tropical rainforests. There are currently three coordination and dialogue instances and / or platforms in the territory, whose geographical scope exceeds that of a parish (administrative subdivision of lower rank) and brings together different stakeholders. 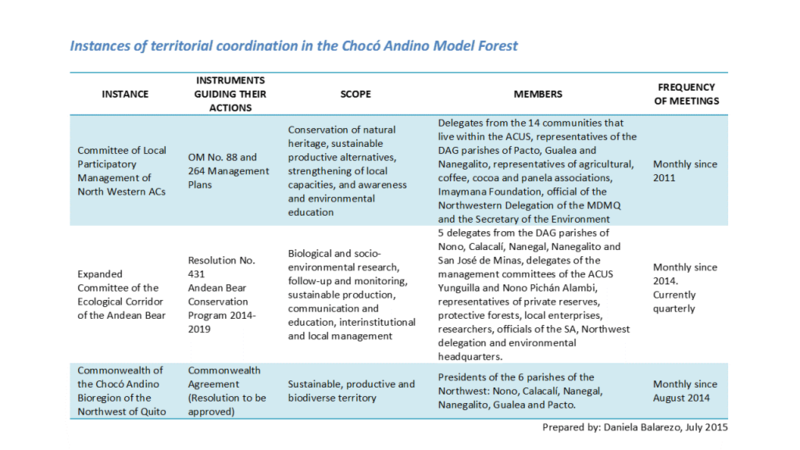 The first is the Committee for Interactive Management of the Areas of Conservation and Sustainable Use (ACUS) in the North-West, the second is the Expanded Committee of the Ecological Corridor of the Andean Bear and the third – more strategic for the institutionalization of the Model Forest – is the Commonwealth of the Chocó Andino Bioregion of the Northwest of Quito. You will find below (see Images) relevant information on each of these instances, such as: the scope and instruments guiding their actions, the members of the communities, the organizations and institutions that are part of each of these governance instances and the frequency of meetings. The Commonwealth Executive Board functions as the general direction body composed of the Presidents of the Decentralized Autonomous Governments (DAG) and representatives of their specialized units (SMS and TMS). The Executive Board relies on technical direction to carry out administrative actions, develop regulations, plan and monitor, and evaluate the implemented policies. 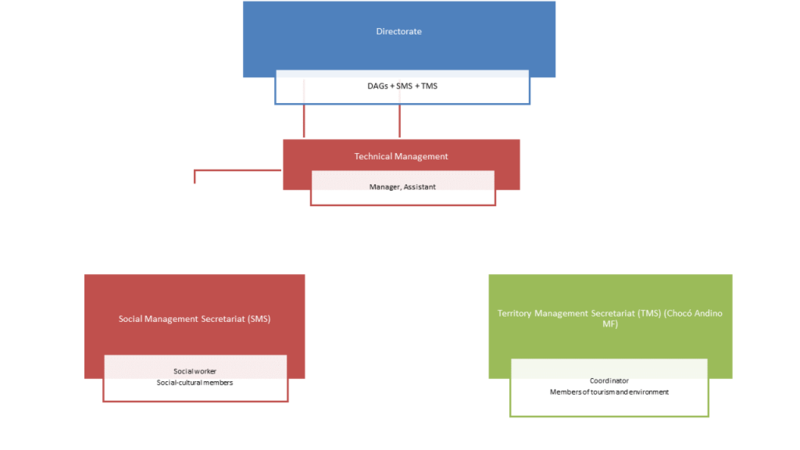 The Technical Management is financed with direct contributions from the parochial DAGs. The secretariats are specialized units that are integrated by a technician who coordinates them and the members of the parochial DAGs assigned to the corresponding thematic area. It is proposed that the Land Management Secretariat correspond to the Chocó Andino Model Forest, whose structure would be composed of a technical coordinator and the 7 representatives of the tourism and environmental sectors of the DAGs. Resources allocated annually by the parochial DAGs would also finance the coordinator’s work. The Model Forest TMS is considered as an entity with a great deal of autonomy and its functions would be related to the stakeholders’ orientation and to the development of projects on topics such as: ecological monitoring, environmental control, conservation/restoration of natural and archaeological heritage, environmental communication/education and sustainable production. Include in the territorial development plans at the parochial level, a regional vision of territorial development that takes into account the conservation and sustainable use approach of the MDQ. Train local governments in forest and environmental management of the landscapes. The Model Forest platform helped to develop the process of putting in place laws (environmental and land laws, public policies,) based on the reality of the rural territory, which allowed the Andean Chocó Territory of Pichincha to be declared in 2018, a Biosphere Reserve of UNESCO. In 2016, special ordinance No. 137 was put in place for the sustainable production and conservation of the Natural and Cultural Heritage of the territory that is part of the Chocó Andino Model Forest. In May of 2017, the Chocó Andino Model Forest, as part of the Commonwealth of Municipalities of the Chocó-Andino Bioregion, won the first Green Prize of Ecuador for Sustainability, awarded to municipalities with more than 100,000 inhabitants. In September 2018, the Environmental Governance Board of the Chocó Andino Model Forest won the most important recognition of the Quito Metropolitan District “Marieta de Ventimilla”, for its contribution to the conservation of the Natural and Cultural Heritage of Ecuador.